This past weekend I had my 27th birthday party. Within the past few years, I have cultivated a reputation for throwing bar crawls on my birthday for both the economic benefits of having people to buy their own drinks as well as the fact that they often provide perfect forum for my sister and I to crazy with theme. And go crazy was just what we did (perhaps a little too much, but that is neither here nor there). 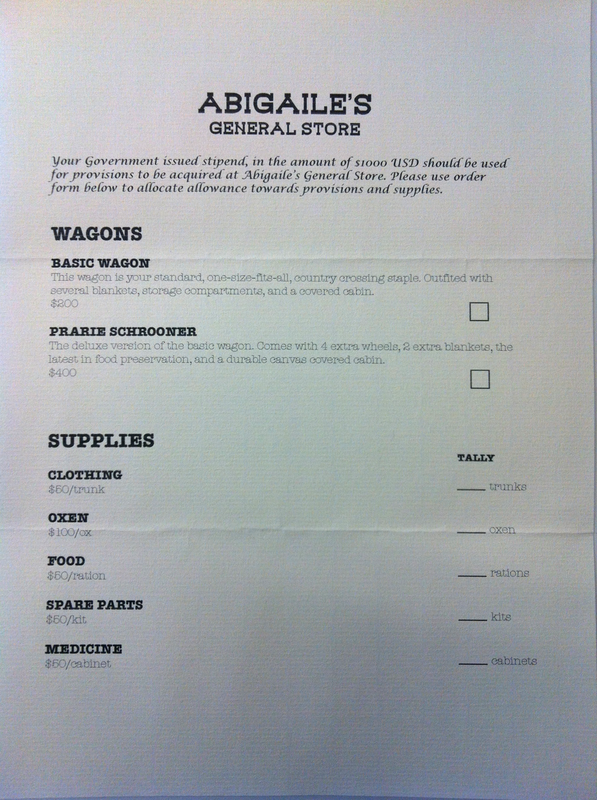 We chose to create an Oregon Trail themed pub crawl. Perhaps the screenshot and outdated graphics below look familiar to you? If so, you were probably part of the generation of school kids who got to go to the computer lab and play "Oregon Trail." 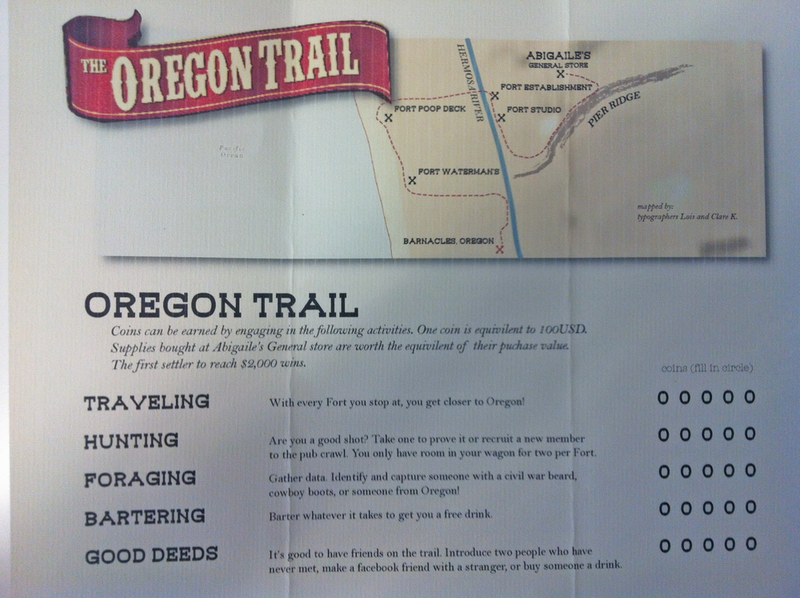 Based on the actual historic wagon route connecting Missouri to Oregon that many families traveled on during the mid-1800's , the game "attempted" to teach school children about pioneer life on the trail. In reality, most children who actually reached Oregon in the game probably learned very little about the real trials and tribulations of those settlers. The most likely outcome (and what has become the most popular joke among cult OT fans) is that you died of dysentery. 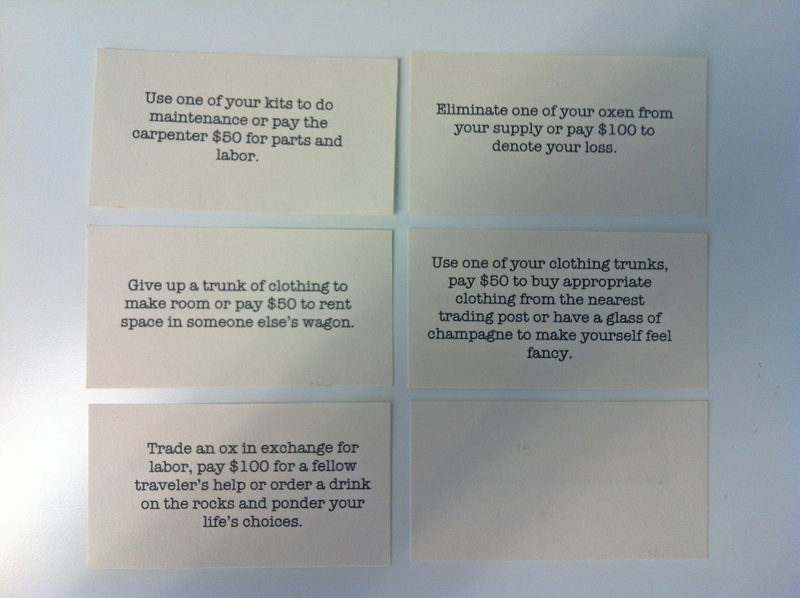 The one unforeseen downside was that people began to avoid me as I started handing out these cards at random, which was not the intended goal since it was my birthday party. However, the ultimate surpise was on me when my friends showed up with this miniature wagon that accompanied us along the trail (pictured below) that they had MADE themselves. Can you believe it?! Do I have amazing friends or what? We partied until the wheels came off, literally (cue obligatory audience laugh). Do I concede that we probably went a little over the top on the preparations? Yes. But everyone seemed to have a good time and perhaps this time around they learned more about what our forefathers who bravely journeyed to new land went through to reach Oregon… (ha! doubtful).